Pump 0.5 to 1 shot into your wet palm. Rub both palms together to generate a low level of lather. Gently massage over your damp face. Avoid contact with eyes. Rinse and pat dry with a towel. Aqua (Water), Glycerin, Sodium Laureth Sulfate, Cocamidopropyl Betaine, PEG-7 Glyceryl Cocoate, Melaleuca Alternifolia (Tea Tree) Leaf Oil, PEG-12 Dimethicone, Acrylates/C10-30 Alkyl Acrylate Crosspolymer, Mentha Piperita (Peppermint) Oil, Panthenol, Xanthan Gum, Sodium PCA, Sodium Lactate, Hamamelis Virginiana Leaf Extract, Benzophenone-4, Disodium EDTA, Aloe Barbadensis Leaf Juice, Sodium Hydroxide, Lactic Acid, Triethylene Glycol, Benzyl Alcohol, Propylene Glycol, Limonene, Sodium Benzoate, Glycine, Niacinamide, Fructose, Urea, Inositol, Potassium Sorbate, Magnesium Nitrate, Citric Acid, Magnesium Chloride, Methylchloroisothiazolinone, Methylisothiazolinone, CI 15985 (Yellow 6 Lake), CI 16035 (Red 40 Lake), CI 42090 (Blue 1). This is my new go to face wash. I have very oily skin and daily use of this has worked wonders. Keeps face clean and refreshed. Far less breakouts since using this product. Also very economical. 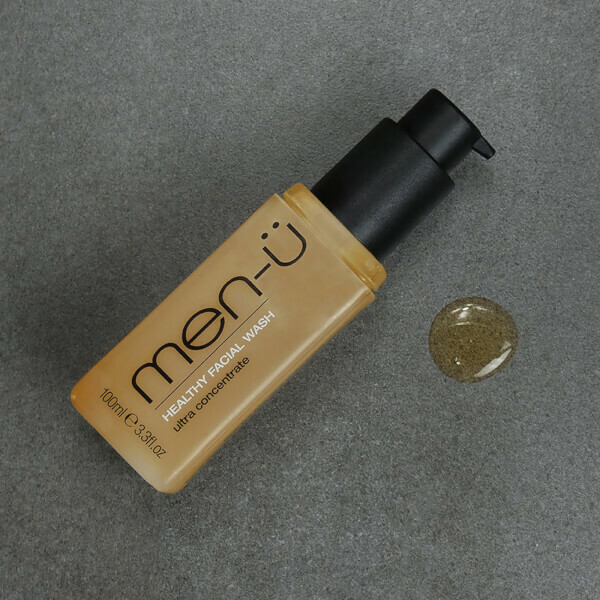 I use this product with the FOREO Luna cleaning brush and the Men-U matt skin refresh gel daily, topped up with the Men-U matt moisturiser when skin feels dry. Very economical, as one squirt really is all you need. Also leaves your face feeling super clean, but my face has started to become quite dry after a few months of using it. Moisturising seems to sort it though. Face washes of this quality are hard to find. This product does exactly as it says and has to be the best face wash I've used. Will totally recommend and will be stocking up on more soon. I like this cleanser as a standard go-to. It's a great product for the price and does a good job. At first I was worrying the tea tree would be over-powering, but I was pleasantly surprised to find it mellow but refreshing. I like low foaming cleansers, so this one ticked that box, as well as been soothing on my skin - especially helpful before shaving due to its antiseptic properties. Overall it does a great job of cleaning my skin after a day of activities or waking me up in the morning, without drying me out. I usually use LAB Series or Jack Black, sometimes Nuxe or La Roche Posay, and this is up there in performance for a fraction of the cost. I would definitely recommend. Very impressive how many washes can be gleaned from such a small amount. Tingles (in all the right ways) and leaves my skin feeling refreshed after each use. Most refreshing face wash i have used. Great for waking up in the morning! Tingles straight away on the skin and leaves my skin in great condition. I use a lot of the products now. Im never left disappointed. I always buy this face wash. It leaves my skin feeling fresh and clean. Really like this face wash, it does a great job of really cleansing the skin. I was dubious about the claims as to how long it would last, but have been using twice a day for 3 months and there's still a bit to go, so it's good value too. Honestly, probably the greatest face wash I've ever used. Super efficient, loads of bang for your buck; the second you apply it, there's an intense tingling and you can actually feel your face becoming invigorated and fresh. Never come across anything like it, no other product gives that same sensation. So impressed with it that this is now my go to face wash, I always order it. Looking to use more of the men-U product line, maybe try the Liquiflex next! One o the best purchases I've made in a while. This product is extremely good has a nice feel to it and makes your face feel really clean and refreshed  it. Can't praise this product enough- smells amazing (like a spa mixed with menthol, mmmm), leaves your face feeling tingly and refreshed, and you notice a difference in your skin after a few days. I use it along with Men-U matt refresh gel and moisturizer, highly recommended Men-U products!! Having used this for a week now I can say I'm incredibly impressed with the face wash, suffering from dry skin I can already see a difference in my skin, it doesn't feel or look dry and has left my skin looking incredibly clear. A big thumbs up from me! Great product. Lasts forever and smells great. I can't speak highly enough of the entire men-u skin and shave line-up. I've bought four of their products and I've been using them for roughly a month and my skin has improved dramatically, along with my confidence. This men-u Healthy Facial Wash is an excellent product - it lasts a long time with a great smell. The Healthy Facial Wash is excellent and I received it very quickly.